Monbeg Dude could miss the 2016 Grand National because of a tendon injury. 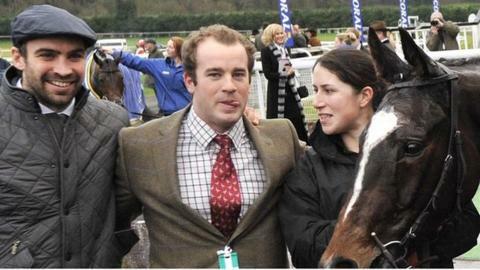 The gelding is owned by former Wales rugby union fly-half Nicky Robinson, ex-England captain Mike Tindall and his former Gloucester and England team-mate James Simpson-Daniel. The 10-year-old suffered the injury while finishing eight lengths behind Many Clouds in this year's race. "It's too early to say whether he'll make it," said trainer Michael Scudamore. Former Wales Under-20 flanker Scudamore added: "It's a race against time. "He's coming along well and we're hoping to have him back for next year's National, but it is going to need everything to go right between now and then. ''He ran so well in the race last year to finish third so it would be lovely to go back there again." Monbeg Dude won the Welsh National in 2013 and has secured more than £260,000 in prize-money after being bought by Tindall for just £12,000.